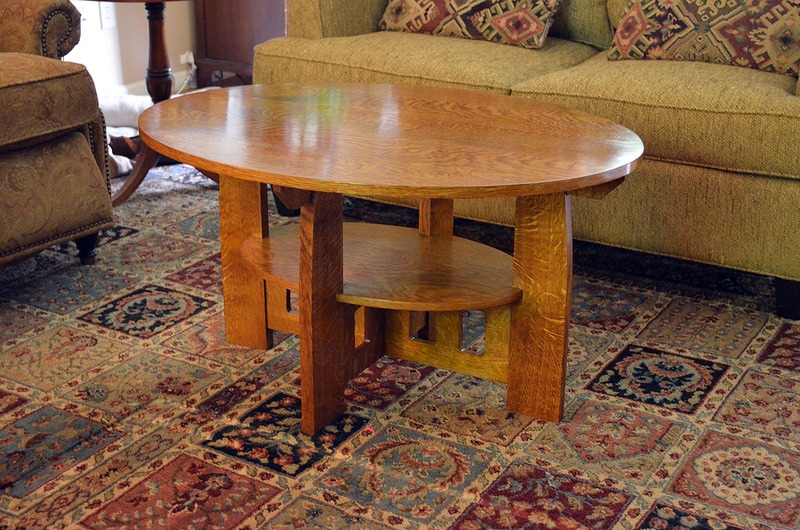 An elliptical top, arched legs, and decorative piercings add grace and beauty to this Craftsman-style table modeled after a library table by Charles Limbert. This scaled-down version preserves the original overall proportions, as well as elliptical top and shelf, gently curved legs, and decorative piercings in the stretchers. Bridle joints hold the legs and aprons together, and a notched bridle joint is used where the stretchers intersect. The legs and shelf are notched where they meet, and slip tenons join the stretchers to the legs. 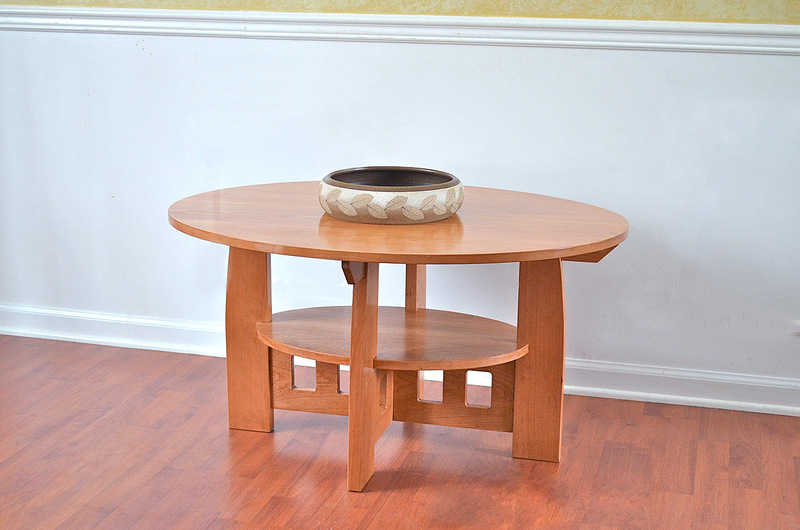 Dimensions: Oval top is approx 3′ x 2′, table top is 20″ in height. Material: all solid quarter-sawn white oak. NOTE: Shipping is done by FedEx; it is the largest package they will take, short of it going freight. I have a custom, heavy-duty cardboard box custom made for this table. The shipping is $275 to any place in continental US. 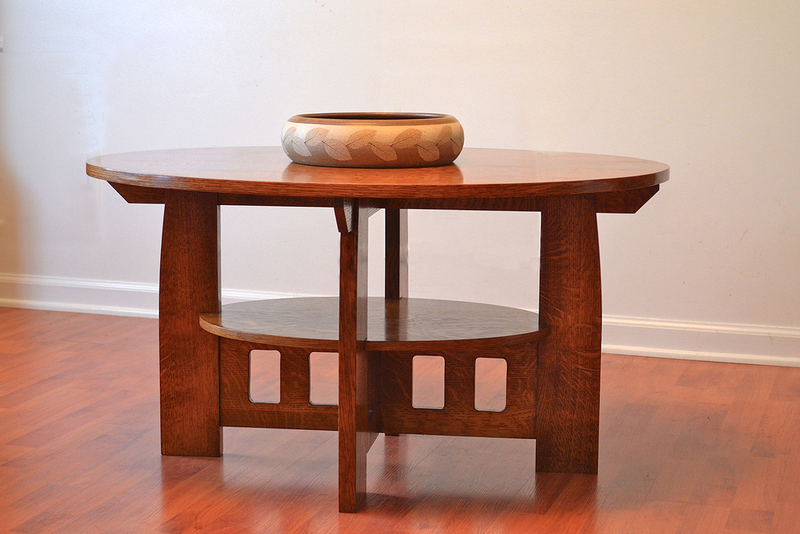 This is the so-called “lost” Stickley Mission style table, which was prototyped, but never was in production. What makes it unique is the front and back splay of the legs. 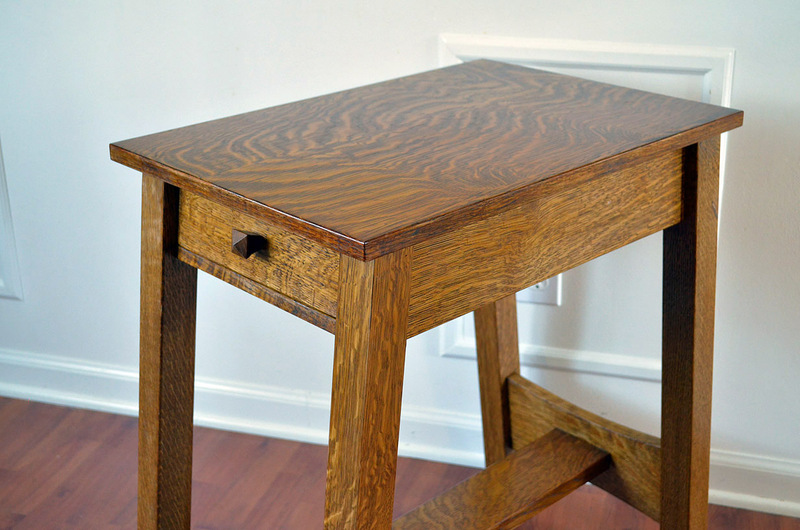 It’s this slight angle that gives this table more character than straight-legged versions that were mass produced. The Arts and Crafts movement wasn’t all just about Stickley or Limbert; the Roycrofters also had a say in the matter; but who exactly were the Roycrofters? Since I’ve been woodworking, I’ve really grown to appreciate items made by hand, by a craftsperson of some kind – I don’t care whether that’s soaps, jewelry, leatherwork, woodwork, stonework, metalwork, painting – you name it; if someone has a passion for a discipline, and is good at what he or she does, I’m lovin’ it, to steal from McDonalds. I also understand now why hand-built items cost a lot more than machine made, one-is-the-same-as-all-the-rest stuff. AND, I also understand that people that are at the top of their field command a top dollar. But $7,000 for a lamp? No, not one made of gold ingots or diamond encrusted. Wood and stained glass. Not that large either, made for a dining room. Well, one of my fellow woodworkers, Kevin Rodel, commands such a price for his ceiling hung lamps or “light boxes” as he calls them, on his website. Are they beautiful? Stunning. Are they made out of the best pieces of cherry and other materials, and with the highest construction quality? Undoubtedly. But how much of a market does one have for this? How many rich people have bungalow or Craftsman style homes, and are willing to shell out this kind of scratch? I’m guessing not many, but I’m sure there are some. When people want something bad enough, price isn’t really an issue – just ask a crack head. 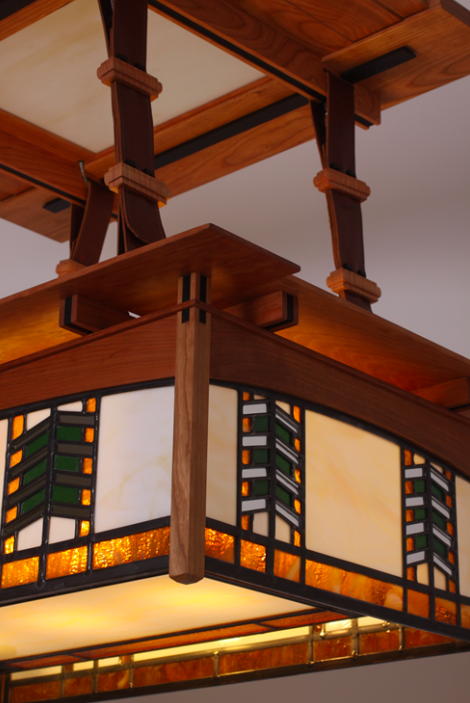 I can tell you with a good degree of certainty that the materials cost – even given the almost certitude that Kevin out sources his stained glass work – is under $1,000. In the photo on this page, he states this piece is 39″ long by 25″ wide and 12 1/4″ deep. The matching ceiling bracket is 34″ by 24″. And you can see, the piece is mostly glass. I’m guessing there is $50 in wood, maybe another $50 for the leather straps, and perhaps $75 for the electrical? There’s got to be then, about a $6,000 gross for him. Yes, I know that it must take him some time to craft this piece; it IS very intricate, and has a lot of details; but it’s certainly not as labor-intensive as say, a relief carving. Given his level of expertise, I’m guessing he has no more than 40 hours of work into this himself. That’s $150 an hour. Does his level of professionalism command that price? I’m not sure I can answer that. 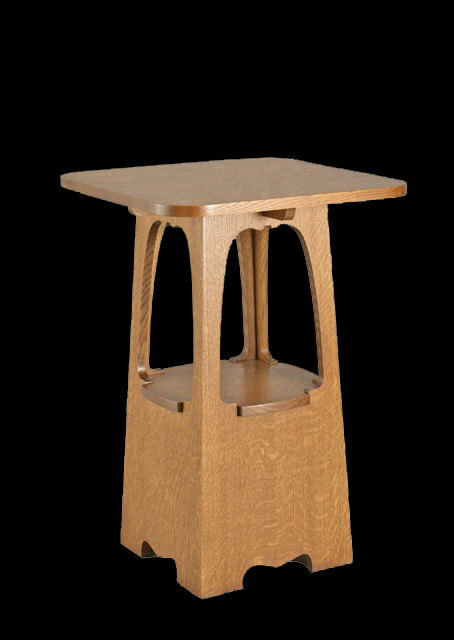 Certainly, he’s a top notch player in the Arts and Crafts genre of woodworking – just look around his website. Guys like him can really call there own shots on pricing; they have mastered their craft, established credibility (Rodel is also an author of an Arts and Crafts book, and authored articles in Fine Woodworking, and teaches as well.) and have a client base. I’ll leave it up to you to decide if that price is right – please note, I’m not knocking his price. What I really wanted to explore is a sub-text of that pricing. That’s the highest price I know of for a piece like that. If you look at all of Kevin’s stuff on his website, it’s all high-priced. Again, maybe he can command that price – the guy does great work. But let’s look at it from the (rich) consumer’s point of view. Let’s say you are a rich lady, and you want to furnish your bungalow home you’re restoring in Pasadena. You look around on line for the best pieces. You find a couple of ceiling lights that are very nice, in the $1,500 range. Then you come across Rodel’s page, and see his wonderful work – at $7,000! What must you think? My guess is, you’ll think something like “Wow, his stuff is really beautiful, he must be a top notch craftsman to be able to ask that much!” In other words, the higher the price, the higher his quality must be. If you have a lot of money, and you want the best, well, you’re probably going to go for this lamp. It’s true that better things cost more…and this is most expensive lamp you’ve seen….so…it must be the best. There’s also this “halo of awesomeness” that pieces like his will impart. Yes, the piece in an of itself is wonderful – but the knowing the high price for it amplifies it’s “awesomeness” as well. It’s an interesting effect, and definitely factor’s into it’s perceived value. People like us often mistake the psychological impact of price. I’m willing to bet that if you took that same piece – use the same photos even – and showed it to a group of people with a spectrum of income middle class to upper class, and told them one is $1500 and the other $7000, most of the people would say that the $7000 one is better. One other issue – Rodel gets to work less, and be paid more. Nothing wrong with that; he can make, say, 5 of these a year, at $7,000 a pop, or 15 a year at $2,300 each. Which would you rather do? 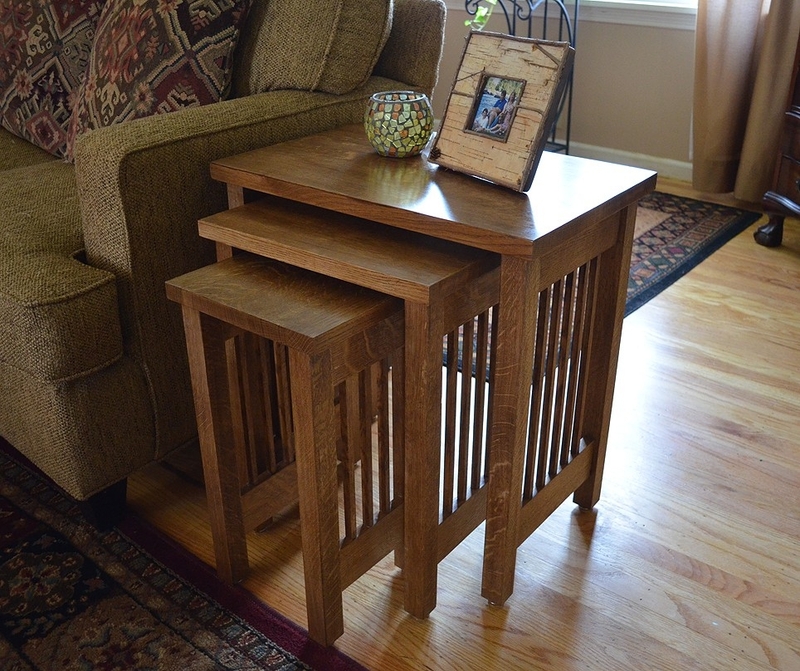 Mission style nesting tables. All quarter-sawn white oak. 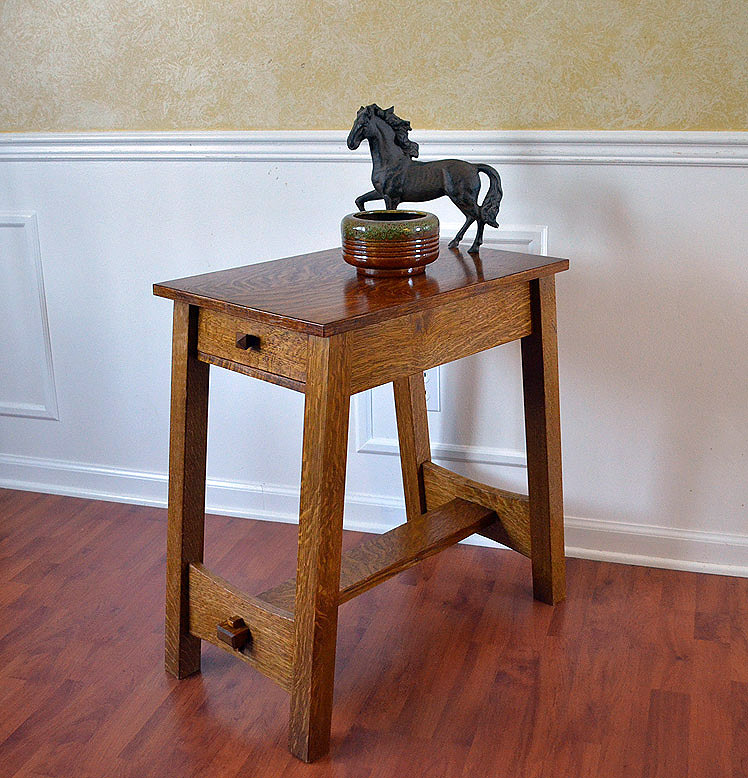 All table tops are 1″ thick solid quarter-sawn white oak. Craftsman, Mission, Arts and Crafts – Whats the difference? People use the terms “Craftsman”, “Arts and Crafts” and “Mission” interchangeably to describe a popular style of the early 1900s; but what is the real difference amongst them? In this short article, I hope to spell out those distincitions. The Arts and Crafts style is the earliest of the three. This style began in England, Australia, America and Canada between 1880 and 1910 as a backlash response to the industrial revolution of the time. It was instigated in the 1860s by artist/write William Morris, who created the “Morris Chair” we still have with us today. The backlash was by artisans fighting back against “soul-less” mass-produced items from large factories. Also, it was a backlash against lavish ornamentation of the Victorian age. They were in favor of the master craftsman, who created all the parts of an item and assembled and finished it, with help from apprentices. This is in contrast to manufacturing plants, whose goal it was to turn out the most pieces possible. The hallmarks of this movement was simplicity of form, to the point of exposed joinery, while emphasising the beauty of the material being used, primarily wood. They also brought in elements they found in British textiles that featured flora and fauna. Usually, they employed carvings, inlays, curvature and other ornamentation. Machinery was not all together rejected by the craftsman; generally, they used it to lessen the mindless repetitive tasks at hand, such as sanding. Use of machines was generally kept to a minimum though. In this photo, you can see the typyical hallmarks of an Arts and Crafts piece – the straight and curved lines, simpleness of form and intricate carving. In America, homes were built that tried to incorporate the stylings of the Arts and Crafts movement, with a modified interpretation, and it was called theCraftsman style; it is an American domestic architectural, interior design, and decorative arts style popular from the last years of the 19th century through the early years of the 20th century. 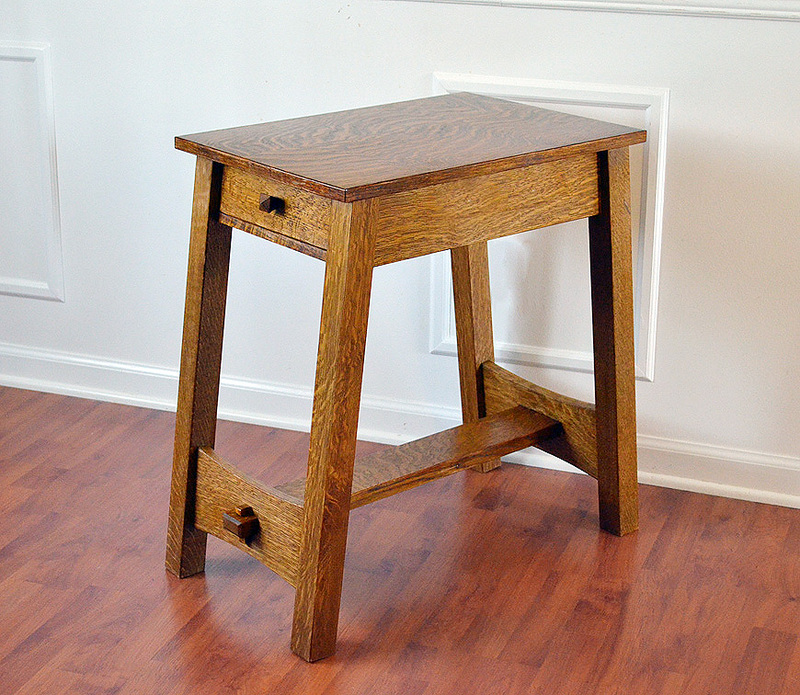 The name comes from a popular magazine published in the early 1900s by furniture maker Gustav Stickley called The Craftsman. It was a great marketing term, as it evoked the image of the piece being made by hand by an artisian, which was exactly the case. 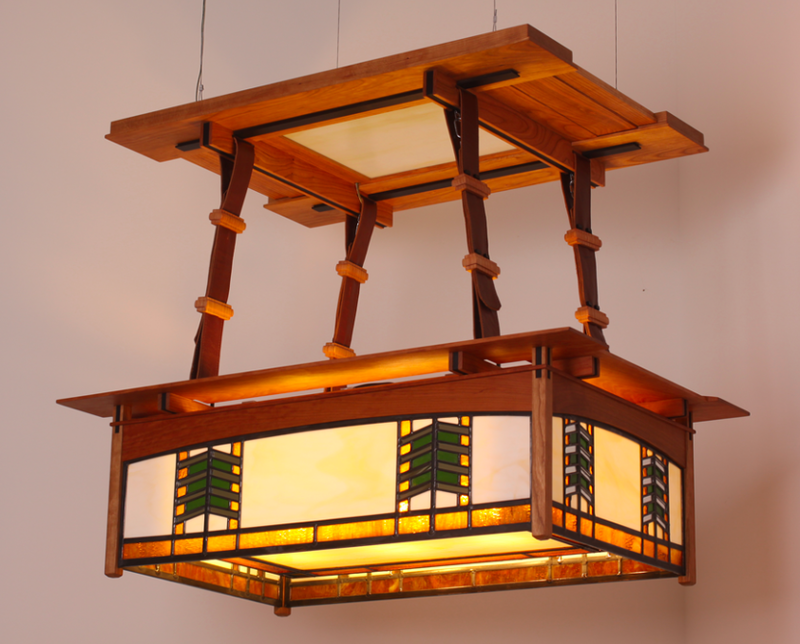 The design lines of the Craftsman style are generally thicker and larger than those of the Arts and Crafts style. Craftsman pieces typically did NOT use carving, inlay, curved boards, and other “decorations,” all of which Stickley was opposed to in his early years of production; however, Stickley’s designs evolved as well, and so it is hard to define a certain piece of furniture as “Stickley” over his 15-20 years of work, as it began to look more like Arts and Crafts in his later designs. 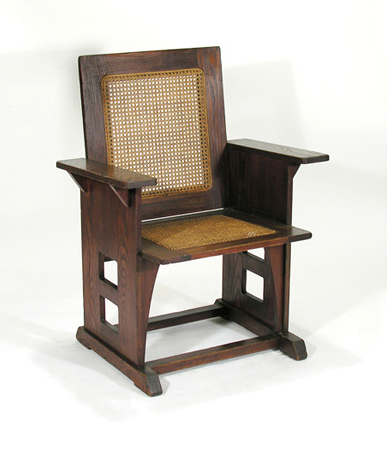 In this photo of a Morris Chair, you can see an example of the simple design, using straight lines and expose joinery with little embellishment that is so typical of the Craftsman movement. Mission styling is the same as Craftsman. But how did this happen? A salesman of Stickley’s was travelling around, trying to sell some items out of Stickley’s catalog. 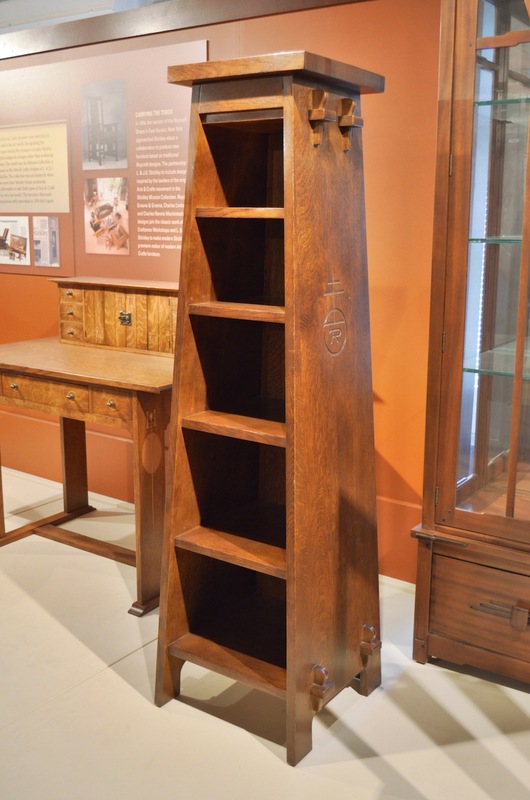 Interviewed by a reporter, this salesman stated that there was a table like “that one” (pointing to a drawing in the catalog) , in a “Spanish Mission in southern California.” The newspaper had printed the story with the word “Mission” in the heading and sidebar, and it stuck.